The first time I read that statement, I was profoundly humbled; and I continue to be. Right now – I’m spending a good portion of my days helping Brian get from here to there, accommodating his scooter and crutches, and trying to run interference for him. I’ve also picked up some of his regular chores – things I really hadn’t paid much attention to until recently. Before his surgery, Brian joked that he’d get a bell “to make it easier for me to know when he needed something” – Ha! He didn’t get a bell, and four weeks out, he’s still alive because of the wisdom in foregoing that purchase. Imagine how annoying it would be if every single time Brian needed something, he rang a bell? Seriously – just ask for whatever you need! I have a name, and we have a relationship, Brian knows he can ask me anything and I’ll do my best to accommodate him. 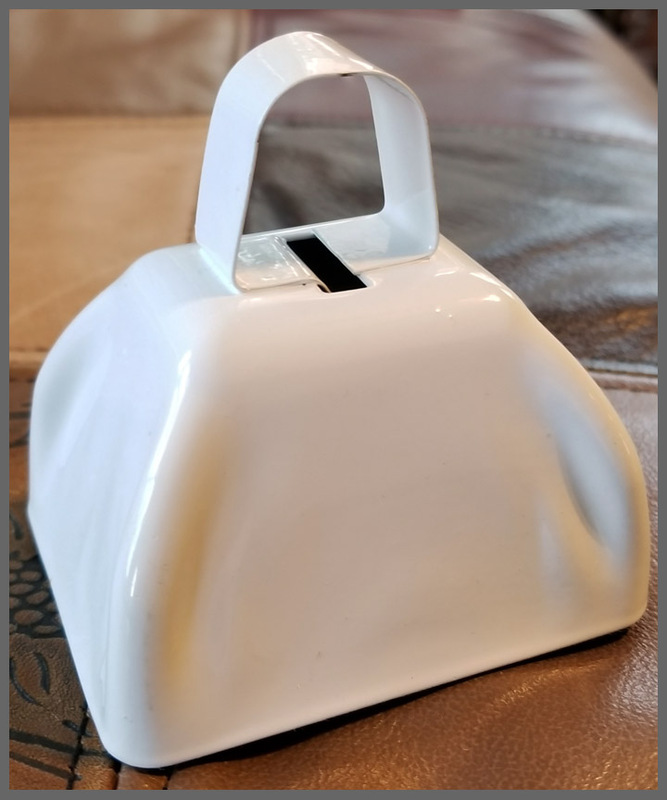 A bell would have been the most impersonal and demanding call for attention; I’m afraid if we had purchased a bell, I would have hidden it, thrown it away, or thrown it at Brian so fast and hard that I would have needed shoulder surgery – and then a bell of my own. However, as I’ve pondered Oswald Chambers’ statement, I’ve tried to think of things from God’s perspective. Do I have a prayer bell? Yes, and I’m afraid I use it more than I should. I know I have a relationship with God, I know his name! and yet, I ping my bell often with a command to give me this, or a get me that, forgetting that God is not at my beck and call. Thankfully, God has much more patience than I do! God wants me to be in a constant state of prayer bringing every concern, every anxiety, and every rejoicing before him. He is there to daily bear my burdens, and to complete all of my joys. I never have to summon God. Even when I do ding my bell, he reminds me that his eye is always on me, he is always meeting my needs, always attentive to me, and about the business of making my path straight. Brian is an easy patient – he’s as eager to do as much for himself as he possibly can – and sometimes I actually have to hold him back so that he doesn’t hurt himself as he tests the limits of his ability. He is a strong man, and doesn’t enjoy this time of limitation. Hmmm, I like to take charge of things and live in my own independence, too; and God often has to hold me back. He regularly reminds me that I’m moving too fast, or too slow, going too far, or holding back too much; but do I listen to him? Or do I plunge ahead and do what I think I can or should do, only to discover that God has a better idea of my limitations than I do? God sometimes lets me get hurt, but I learn from my pain. And he often lets me take risks I shouldn’t take; but I learn my limitations from my failures. He always is there to pick me up when I fall, and comfort me when I hurt. He never says, “I told you so” even though he always tells me so. Brian knows he must stretch his ankle as much as possible, flex his foot, and prepare for the physical therapy to come. Yes, he’s still in a non-weight-bearing-boot and we’re hoping he will be able to begin therapy next week, so that when he can put weight on his foot, his calf is strong enough to support him. But all of that depends on his current pain level. He must take Advil often, and when he backs off on it – the pain prevents him from stretching. And, I’m so much like that – I need to faithfully stay in the Word of God daily – and carry it in my heart and mind throughout the day, or life is too painful. It is too hard to stretch myself, or allow God to stretch me. It is easier to sit in complacency, laziness, or the comfort of doing only what I want to do than it is to work my spiritual muscles. However, only God knows what is ahead of me. Only God knows how flexible I need to be. Only God knows how much strength I will need. And the only way to prepare for the future is to stretch my spiritual muscles today; to participate in spiritual therapy! God is the best therapist. He knows exactly how far to stretch my patience, love, kindness, compassion, gentleness, understanding, and self-control to strengthen them rather than injure them. He knows my strengths and my weaknesses. Only as I develop the muscles that God is working out in me will I be able to enjoy and complete all that he has prepared for me. What about you? Who has God placed around you? A strong-willed child? A complaining friend? An ungrateful coworker? A free-spirit? A rebel? An obstinate person set in his or her own way? Someone who is unfaithful and has let you down? Self-sufficient strangers? Are you dinging a bell demanding God’s attention and service whenever you need it? Or are you daily sharing your life with a Friend who alone can provide for all your needs? What spiritual muscles is God strengthening in you? Will you work with him to become the strong man or woman of faith that he intends you to be?